There is not one muscle group neglected. Total choice workout...With the Dynamic Rower I finally get the workout I've always deserved but could never find. A lifetime fan here. The Dynamic Indoor Rower offers the closest simulation to rowing on the water and was developed to meet the specific training needs of the competitive rowing athlete. Unlike the Model D and E Indoor Rowers, the footrest on the Dynamic is free to move and there’s minimal movement of body mass throughout the stroke. The Dynamic demands similar concentration and body control to that needed when rowing in a boat, making it an excellent sport-specific training and coaching tool. Using the Dynamic Link accessory it’s easy to join together two or more Dynamics, so you can train as a team boat. If you’re looking to move faster on the water, the Dynamic is what you’ve been waiting for. How the Dynamic Indoor Rower differs from the Models D and E.
Every Dynamic Indoor Rower includes our most advanced Performance Monitor, the PM5. The powerful PM5 provides repeatable, comparable data for every ride. 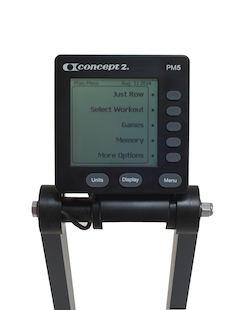 The PM5 offers automatic “Just Row” mode, or allows you to set up a variety of workouts. The monitor gives you a wide range of data, including pace, watts, stroke rate (spm) and Calories and automatically stores this information in either its internal memory or an optional USB flash drive. The PM5 uses power from 2 D-cell batteries whenever it is not being powered by the flywheel. The adjustable monitor arm on the Dynamic lets you position the monitor where you prefer. The footrest is free to move back and forth on the monorail. A drive cord connects the foot carriage to the handle and transmits the combined leg and upper body force to the flywheel. The Dynamic encourages body control, early body preparation and good “connection” between the oar handle and footrest during the drive. 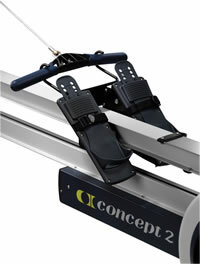 The drive system of the new Dynamic Indoor Rower uses a high-tech, high-strength synthetic cord. The cord’s light weight results in a system that is more responsive to the rower’s movements and quick to react, especially at high stroke rates. The Dynamic responds to your effort on every stroke, so you are in full control of your exertion and resistance at all times. The spiral damper allows you to quickly adjust the airflow to the flywheel, so you can change the feel of the stroke to suit your preference, easily moving between feeling like you’re in an eight or a single or adjusting to a slower “heavier” drive movement. The Dynamic must be stored fully assembled, but with a small 76 in (193 cm) footprint when compared to a Model D or E on Slides (132 in/335 cm), you’ll be able to get more Dynamics in your boathouse. All Concept2 Dynamic Indoor Rowers ship with an optional Wind Shield. The clear plastic Wind Shield is located on the top of the flywheel and deflects air from the flywheel away from the rower’s body. Athletes who prefer the additional breeze can easily slip the Wind Shield off. Our machines are well-known for their durability and construction. Tough and built to last, our machines withstand rigorous use in boathouses, training centers, living rooms, hotels, health clubs and military bases around the world. We make sure our machines are easy to care for so you can focus on using your investment, not maintaining it. You can use the Dynamic Link (sold separately) to connect two or more Dynamics together for team training. Using the Link you can easily row with a partner, set up an entire 8+, or anything in between. Monitor Arm Aluminum. Pivots for storage and to adjust monitor height. Monitor angle can also be adjusted. Light grey with dark blue-grey accents. Why is it called the Dynamic Indoor Rower? The Dynamic Indoor Rower more closely simulates the physics experienced while rowing a racing shell and the "dynamics" between the boat and athlete. 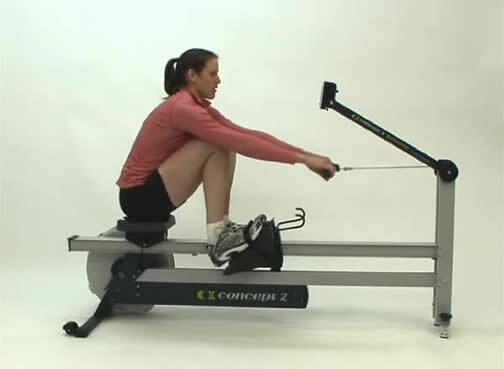 On the dynamic erg, a user's body mass is relatively stationary while components of the machine actively move in response to the rowing motion, similar to the way a lightweight rowing shell moves around the rower's body. How does rowing on the Dynamic compare with rowing on the Model D or E? The functional difference between the Dynamic and the Model D or E is that as you row, your footrests do most of the moving rather than the seat. The seat is also free to move, but due to the physics of rowing, the seat movement is minimal. The Dynamic encourages body control, early body preparation and good “connection” between the oar handle and footrests during the drive. On the Dynamic, body mass movement is minimized during the stroke cycle, while on a Model D or E, total body mass moves back and forth during the stroke cycle. 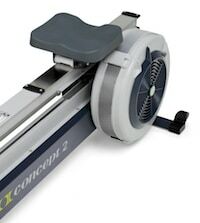 What is the difference between the Dynamic Indoor Rower and using the Model D on Slides? Both the Dynamic Indoor Rower and the Model D on Slides attempt to mimic boat dynamics. The Dynamic offers a feeling of rowing in a lightweight shell, because only the foot carriage is moving. This is consistent with the footrests fixed within a boat, where the boat is surging with each stroke relative to the water. The Model D on Slides is more like rowing in a heavy boat, due to the movement of the entire mass of the machine. Both the Slides and the Dynamic (when used with the Dynamic Link) allow you to connect multiple indoor rowers for rowing as a team. Which indoor rower is right for me? For general fitness, the Model D or E may be a better choice, since it provides an efficient workout for all abilities. 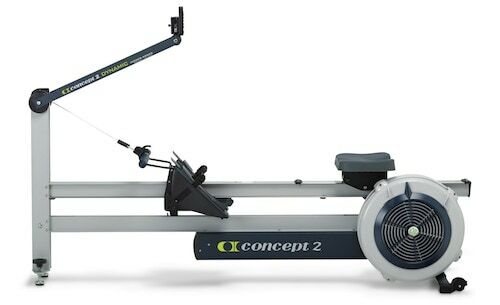 The Model D is our most affordable option for those looking for a rowing workout. Athletes who are looking for a more specific technical approach should consider the Dynamic. It encourages the rower to use the same precise coordination, connection and power application required to achieve maximum speed in a racing boat. The Model D is currently still the standard for rowers who are training for indoor rowing competitions, attempting world records, or submitting scores for recruiting. With its shorter size, will the Dynamic fit better in my house? You should understand the differences between our indoor rowers before considering the Dynamic only because of its size. In use, the Dynamic has a smaller footprint, (76 inches/193 cm) than either a Model D (96 inches/244 cm) or a Model D on Slides (132 inches/335 cm). However, both the Model D and Model E can be quickly separated into two compact pieces for moving and storage. All three models include caster wheels to make moving them easy. The Dynamic, however, does not separate for storage and the assembled unit weighs 92 pounds (42 kg); it works best in a dedicated location. It is important to understand the function of the Dynamic before choosing it on the basis of its footprint. Will the Dynamic be easier on my back? There are no tests that can claim that the Dynamic is better for backs, knees, or other injuries; however, there are important differences between traditional ergs and the Dynamic that may address the source of problems for some people. On a static erg, body weight moves back and forth, changing the direction of that moving mass (the body) every stroke with the back, core muscles and hamstrings. Perhaps the more significant difference is that the Dynamic promotes rowing at a higher stroke rate than when rowing on the Model D or E, more similar to an on-water stroke rating. It is commonly understood that intense rowing at low stroke ratings results in high force per stroke, which is transmitted through the rower's body. Higher stroke ratings on the Dynamic result in a lower force per stroke for the same level of power output. Do you feel the breeze from the flywheel while you row? On the Dynamic Indoor Rower, the flywheel is located near the athlete, providing some airflow from below while you row. All Concept2 Dynamic Indoor Rowers now ship with an optional Wind Shield. The clear plastic Wind Shield is located on the top of the flywheel and designed to deflect air coming from the flywheel away from the rower’s body. Athletes who prefer the additional breeze can easily slip the Wind Shield off. Using the Wind Shield will slightly reduce the drag factor at the current setting. The flywheel damper may be adjusted as needed to maintain the desired feel. Learn more about damper setting and drag factor on the Damper Setting 101 page. 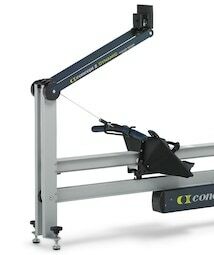 Customers who purchased a Dynamic Indoor Rower prior to the Wind Shield’s release may call customer service for details on obtaining this accessory as a retrofit. The Wind Shield is also available as a replacement part. Why is a cord used on the Dynamic instead of a chain like on the Model D and E? The drive system of the Dynamic Indoor Rower uses a high-tech, high-strength synthetic cord. The cord's light weight results in a system that is more responsive to the rower's movements and reacts more quickly, especially at high stroke rates. Using a cord instead of a heavier chain makes a lighter handle return force possible, which is more similar to the feel of rowing in a boat. The synthetic cord is three-and-a-half times stronger than the Model D and E chain, and is used for sailboat rigging, commercial fishing nets, industrial lifts and slings, and even trapeze support ropes. However, monitoring the cord is an essential part of routine maintenance. Owners of Dynamic Indoor Rowers should inspect the cord regularly for visible signs of wear. The cord may become fuzzy, but does not need replacing until the fibers begin to separate. How will times on the Dynamic Indoor Rower compare with times on the Model D/E and Slides? There are dynamic and mechanical differences that work both in favor of and against each type of indoor rower. Times may vary slightly depending on the individual. We are finding that there is a learning curve, and as individuals spend more time on the Dynamic, their times become more similar to what they expect on the Model D or E.
Will the Dynamic Indoor Rower be used in indoor competitions? There are no planned changes for the World Indoor Rowing Championships. Race directors make individual decisions on what events to include in their races, so some indoor races may incorporate the Dynamic Indoor Rower at their discretion.